West Grand Lake is famous for its salmon and togue fishing. The many connecting lakes offer stupendous bass fishing. West Grand is a glacier lake, carved out by the slow moving ice mass of long ago. It is spring fed, crystal clear, reservoir quality by any standard. 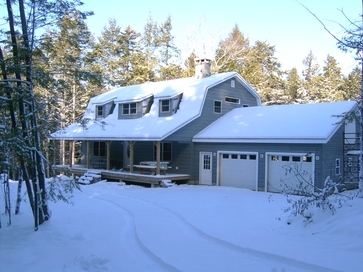 Our cottages are located four miles up lake from the renowned village of Grand Lake Stream. We are located on the eastern shore near Kitchen Cove Point, facing west for fantastic sunsets. Bob Hazelwood had been the proud proprietor for more than 35 years. He had striven to maintain the rustic charm and forested backyard for many seasons. His daughter Nan and her husbacnd Sam now manage the property and have built their new home on the back parcel. We offer our own boat launch and private beach. Several docks and a rock jetty provide excellent shelter for your boats. The rates are from $500 to $900 per week, from Saturday to Saturday, or by special arrangement. Daily rates are being offered spring and fall if you prefer to stay only a few days; the rates then range from $90 to $160 per night, depending on which camp you choose and how many people in your party. In addition to the rate is a lodging tax of 9%. A $100 deposit is required to secure your reservation (this is refundable with a 30-day notice prior to your selected time). We accept personal checks travelers checks, and of course, cash for payment. We do allow pets as we feel your family dog needs a vacation too. Please let us know if you will be bringing your pet(s): a $50 dog fee is added to your bill. We have TV's and upgraded antennas for 2016, if you want to keep up with the outside world. Your cell phone may work since the new cell phone tower was installedin 2015! We do have Wi-Fi available at The InterNet Cafe (our front porch)! Guest sign in available at your request. The Log Cabin was built in the 1930's, and offers you the Maine experience you have been seeking. The granite fireplace, central in the cabin, is the tell tale sign of local craftmanship. The logs were hand-hewn and became the walls. The log rafters are exposed and you see the details of the construction. Rustic, yes, but with lots of amenities too. Hot water, electricity, telephone, and TV too. This year we remodeled the kitchen to include a dishwasher, new floor and counter top too. The bathroom, sited between the two bedrooms, comes complete with the old-fashioned claw-foot bathtub. An adapter lets you take a shower too. The kitchen is fully equipped and some linens are supplied (please bring your own sheets and towels). This cabin comfortably sleeps up to four adults. The Beach Cottage is ideal for families with small children, or for larger groups. Recently remodeled, this cottage is handicap accessible on the main level. There are two bedrooms, 'friendly' bathroom, main living area, nice kitchen, and the dining room addition leading our to the barbecue area. Spanning the front is a nice deck with an access ramp. the loft area has numerous beds and lots of games and toys - a great place for the kids. This cottage will accommodate up to seven people. If you find the need for an additional bedroom and bath, we have available the Guest Camp, which is situated between the Log Cabin and the Beach Cottage. This would be an ideal place for the in-laws, or the unexpected friends who are suddenly able to get away. It is a self-contained dwelling, complete with kitchen/dining/living area combine, with a private bedroom with connecting full bath. True to Hazelwood's tradition, a remodel has been done, enclosing the side deck - this new room is ideal for an afternoon nap, the surrounding windows open, a breeze, and the sound of the waves lapping the shore to sooth you as you drift off to sleep. Our new home is complete. As always, we have plans for the future, a bit of new construction will be in the works soon.